My copy is, like most of my Wyndhams, an early 60s Penguin paperback with an almost Munch-like illustration on the cover. It's too much like The Scream for John Byrne, the artist, not to have been referencing him. I tend not to re-read this one as often as some of Wyndham's other books. I'm not sure why, because when I do, I find myself captivated. This time around, a number of different things surfaced for me - as is often the case - but some of the parallels and anticipations of things to come, juxtaposed together in the one story, were quite startling and I'm not sure why I never noticed them within that frame of reference before. This is another of Wyndham's masterful stories of extra-terrestrial invasion, only this time it actually happens. There is alien technology, but there are subtleties that could only be Wyndham's - no flashy firepower or forceful overpowering of the planet. UFOs certainly - which are the first warning, but UFOs that appear in the form of clusters of mysterious red, fuzzy spheres which appear and then vanish beneath the surface of the ocean. A few military types have a go at them with traditional weaponry, both air and sea-borne. Mike and Phyllis, by chance, are witnesses to one of the earliest sightings while on a cruise for their honeymoon. As journalists for the EBC (English Broadcasting Commission), they are able to convince the captain of the ship to share with them his official report as well as getting him to divulge information about other sightings. They file a report that is broadcast back in England, but like others elsewhere, partly due to the fact that beyond the curiosity factor nothing else seems to happen, the story fizzles and dies. Some time later, scientific reports start to emerge about deep sea silting appearing at unprecedented shallow depths. Another curiosity, which fails to gain much momentum. Then ships mysteriously start to go down, eventually halting all but coastal seafaring. However, it isn't until the first attacks on people that any notice begins to be paid, and even then, the locations are remote, and it remains a tragic, but smallish story. Enter Alistair Bocker, scientist of some notoriety and rapidly gaining a reputation as a sensationalist and crank, as he comes forward with wildly extreme explanatory theories and predictions. He sponsors a trip to the location where he predicts the next attack will be, taking with him a press corps, including Mike and Phyllis. They get their story; Bocker was right in his location, but wholly unprepared for the risks involved, and four of their team are lost, along with a large percentage of the local population. Arising from the sea in the depths of the night, huge 'sea tanks', featureless metal vehicles, make their way into the square of the seaside town and explode sticky tentacle-like filaments which take hold of their powerless victims, pulling them in back into the ocean. Phyllis is only saved when one of the filaments snakes through the window of their room but Mike manages to hold on long enough for her skin to tear away, freeing her. In due course, these attacks increase around the world and the authorities begin to find ways to defend themselves. New technology in depth charges also allows for bombing in the deeps, where it is known the invaders lurk, and for a while things calm down. Until the sea levels start to rise. And rise... Again, Bocker leads the way, predicting that this is the beginning of the end game. Again, he is dismissed. Once again, he is right - sea temperatures are warmed in the Arctic and Antarctic and the great glaciers start to calve, currents driving the icebergs towards the equator, melting and bringing more and more water advancing on the land. Inevitably, as the waters rise, communities that are already in crisis in the wake of the ceasing of sea freight due to the dangers to shipping begin to break down into anarchy. The English government, relocated to higher ground in Yorkshire goes silent suddenly as their enclave is over taken by those on the outside who believe they are holding out. At this point, Mike and Phyllis decide the time has come to leave the EBC stronghold in London and risk the perilous journey to their cottage on high ground in Cornwall - which, as Mike discovers on arrival, Phyllis has secretly fortified and equipped with supplies to last a long time. Structurally, the book introduces us to the story in hindsight with a brief preface where the narrator, Mike Watson, discusses their present isolated, post-disaster situation with his wife Phyllis, and says that he'll write about what happened. That, while there will be numerous official documentations and histories of events created, as someone who was there from the beginning, he has a particular take on it and that a more personal account will have a different value than the 'official' versions. It then moves straight into a chronological narrative that is broken into three phases. Each has its own flavour, but all are marked by tones of increasing desperation as it becomes obvious that the human population is engaged in mortal combat with an enemy that they can't physically identify, can't engage with directly, and can't take on on any level playing field. In the very beginning of Phase One, while Mike is still setting the scene, there are a couple of paragraphs that I have read so many times in my multiple readings of this book, but this time they really grabbed my attention. It began so unrecognizably. Had it been more obvious - and yet it is difficult to see what could have been done effectively even if we had recognized the danger. Recognition and prevention don't necessarily go hand in hand. We recognized the potential dangers of atomic fission quickly enough - yet we could do little about them. If we had attacked immediately - well, perhaps. But until the danger was well established we had no means of knowing that we should attack - and then it was too late. I worked for a year on contract at the Sydney Jewish Museum as a Holocaust educator. During that time I researched and wrote three education kits to compliment the courses we ran for schools at the Museum. One of them was the rise of Nazism in Germany from 1933 to 1939. Part of the kit included an article by the resident historian at the Museum, Konrad Kwiet. It had started life as the chapter of a book, and was written originally in high academic German. I was working from an equally academic English translation which I had to edit down from the original 5,000 words to 3,000 to fit into the kit. It dealt with the incremental changes to racial laws from their inception as they were implemented to segregate Germany's Jews from the Aryan population. Many people have asked, in the wake of the Holocaust, why the Jews walked passively to their deaths in such huge numbers. Of course, not all of them did. Many fought in partisan groups, resistance movements and in the camps, and many eluded the dragnet of deportations, hidden by people who risked their own lives to do so. However, one aspect of the article that has haunted me since was how something can creep up on us incrementally. Konrad documented so many responses from the leaders of the Jewish community in response to each new level of restrictions - while some took the implicit warnings seriously and got out while they could, many more said to themselves each time, "if this is all that's going to happen, we can deal with this..." Until, it was too late. This is an all too human tendency. We are, most of us, innately optimistic. We try hard to put a good face on things even in the worst of circumstances. If you consider that this was published less than ten years after the end of World War II, Wyndham's war experiences must have been still very fresh in his mind, and he and the rest of the world would still have been struggling to come to terms with the horrors of the eleven million dead at the hands of Hitler's campaign of hate - six million Jews and five million others. The other, more contemporary connection that emerged for me was the parallel between the eco-war waged by the invaders in Wyndham's book and what we are watching happen to the planet now as a result of our own industrial excesses coupled with the evolution of planetary change. 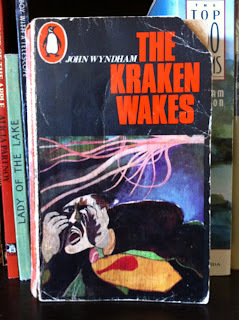 In this case, there's a spooky visionary-ness on Wyndham's part, which is by no means unique to this book. The Maldives are disappearing - these tiny islands have been an off-beat tourist destination for a long time. White, white sand, crystal clear ocean, a pristine environment and a fascinating local population attract people year round. However, rising sea levels are a real threat to this tiny nation, and already, calls are going out to other countries for refuge when, eventually they go under. The high ground will become prized, as it did in the novel. The struggle for survival in the face of the encroaching waters, when whole societies imploded, turning on each other, can be seen as a warning for us now. What do we need to do to plan for a future where the world, already over-populated and with dwindling resources, could be very different? I think I have led the counterforces in this war, though I never before recognized the source. In the video game X-COM: Terror from the Deep (http://en.wikipedia.org/wiki/Terror_from_the_Deep) the player faces just this invasion. Wyndham is never referenced, but it's possible he was used, as the game was produced by a UK studio, where Wyndham may be better known, and the designers were up against a hard deadline, and a whole ready-made story would have been very helpful in that regard. It's a great game, and I still fire it up from time to time. I'll have to ask Twenty One about that game - he's the gamer in the family and may be aware of it, but I'm in blissful ignorance! That brown eyed/blue eyed thing has been doing the rounds of schools and other forums (even Oprah Winfrey did it on her show once) for a very long time now - many of the students who came to the Museum had done something like it prior to their visit. It can be very powerful for people who've never experienced any kind of segregation - regardless of which side of the colour fence they fall in this particular example. UInfortunately, it's more complex than that out there in the world, and how we teach beyond people's prejudices for the long term, I don't know, except that I do know we have to keep trying. Here you go Jack - see Phoenix's comment below. Told you he would know it! I myself haven't played X-COM: Terror of the Deep. I'm not a huge FPS player; even though I have played most of the Call of Duty games and most of the Battlefield games up to and including Battlefield 2. I understand, however, the harsh realities of game development; as with any story writing; the deadlines and the appeal of having ready-made stories sitting there. There are many games that I have played where they are variations on the same theme. Some are even blatant rip-off's that are simply repackaged. Blizzard's Starcraft II is merely an HD re-rendered version of the original Starcraft from over a decade ago with a slightly more engrossing story. Also; if you look at almost any "standard fantasy setting" game; e.g. Elder Scrolls, Dragon Age, Warcraft, etc. it is all ripped off Tolkein. The mere fact that the world of elves, dwarves, undead, etc. is considered "standard" is a bit of a disappointment really. However, it is fun to throw fireballs, frostbolts and all manner of magic abilities at things. There are even games that are so blatant in their ripping off of novels in particular that they do the ironic tongue-in-cheek moment of referencing their plagiarism. Unfortunately; no games come to mind instantly; but I have seen them. Often some games will even self reference their own spin-off's or originals in the same ironic fashion (see the Command and Conquer series'). Thanks Phoenix - I've drawn Jack's attention to your comment, so as he knows the gaming world way better than I do, he may weigh in again. Kaz!!! I'm so scared of reading your review for fear of spoilers (if there are any)! This is the last Wyndham book that I'm looking for. None of our bookstores here in Manila has it. I couldn't find it in Bangkok and Singapore when I went there last month. I'm iffy about ordering online. Anyway, I'll bookmark this for the meantime and return to it as soon as I've read this. OK - sorry - didn't realise you'd not read this one. Don't read my post yet - there's enough there that would tell you too much in advance. The last words, 'we got through last time.' made me think; Yes, but i we learn anything. There was the holocaust in WW2, but then there was an ethnic cleansing in WW1; around Turkey I think and of course there was one in the 90s. H G Wells in the time machine showed peoples destructive war like nature. The similarities are there with Wyndham's stories, but they are still great reads. I think it's probably the Armenian genocide you may be referring to 'around Turkey'...? And then the Serbo-Croat disaster, Pol Pot and the Killing Fields, Dafur, the Khurds, and so it goes on. I think that in speculative fiction like Wyndham's, there is a message there for any of us with the wit to see it. Question is, what do we do? Many of us feel overwhelmed and the response is to do nothing because people as individuals feel powerless.Yet, we can look to each and any of those events mentioned and find stories of single people who did stand up and do something - and it had an effect. So, perhaps the lesson to absorb is that the efforts of a single person can be multiplied for the greater fgood if we all start to take that on board for ourselves. Hello, Kaz! Finally, I get to read this review of yours! And I love your thoughts about this book! In one way, reading this book was a great experience for me, as I finally finished all the Wyndham works that have been reissued. In another way, it's also a bit sad since his other works, particularly his short stories, are still out of print. Oh well, that's happy hunting for me. I really like reading the personal tidbits that you managed to inject into your review. You were a Holocaust educator! I completely agree with you that we are innately optimistic (take that, Schopenhauer!) and we tend to make several denials until it's too late. Oh, the humanity! Kaz, completely off topic, but have you read Hitler's Willing Executioners by Daniel Jonah Goldhagen? It's one of my best reads about the Holocaust and WWII. For some reason, I am quite fascinated by this unfortunate period in our history. I feel that the more people study about it, the less likely that it'll happen again. Anyway, in the book, the author presents a very chilling thesis: that the everyday German were all too willing as participants in the Holocaust. I think you'll find it fascinating reading.